WHEN THE COLD WAR ended 25 years ago, the Soviet Union vanished into the ash heap of history. That left the West's "useful idiots" — Lenin's term for the ideologues and toadies who could always be relied on to justify or praise whatever Moscow did — in search of other socialist thugs to fawn over. 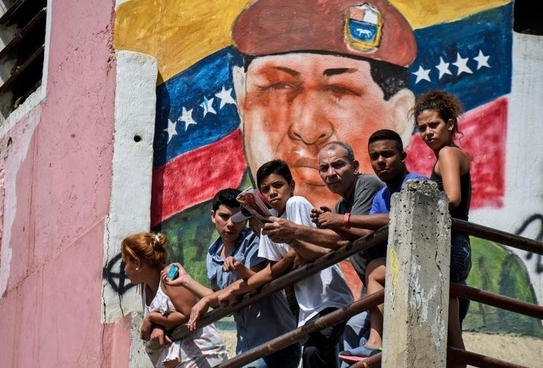 Many found a new heartthrob in Hugo Chavez, the anti-Yanqui rabble-rouser who was elected president of Venezuela in 1998, and in short order had transformed the country from a successful social democracy into a grim and corrupt autocracy. With petrodollars pouring in, Chavez had free rein to put his statist prescriptions into effect. The so-called "Bolivarian revolution" over which he — and later his handpicked successor, Nicolas Maduro — presided, was an unfettered, real-world example of anticapitalist socialism in action. Venezuela since at least the 1970s had been Latin America's most affluent nation. Now it was a showpiece for command-and-control economics: price and currency controls, wealth redistribution, ramped-up government spending, expropriation of farmland, and the nationalization of private banks, mines, and oil companies. In a Salon piece titled "Hugo Chavez's economic miracle," David Sirota declared that the Venezuelan ruler, with his "full-throated advocacy of socialism," had "racked up an economic record that . . . American president[s] could only dream of achieving." The Guardian offered "Three cheers for Chavez." Moviemaker Oliver Stone filmed a documentary gushing over "the positive changes that have happened economically in all of South America" because of Venezuela's socialist government. And when Chavez died in 2013, Jimmy Carter extolled the strongman for "improving the lives of millions of his fellow countrymen." Venezuela this Christmas is sunk in misery, as it was last Christmas, and the Christmas before that. Venezuelans, their economy wrecked by statism, face crippling shortages of everything from food and medicine to toilet paper and electricity. Violent crime is out of control. Shoppers are forced to stand in lines for hours outside drugstores and supermarkets — lines that routinely lead to empty shelves, or break down in fistfights, muggings, and mob looting. Last week the government deployed 3,000 troops to restore order after frantic rioters rampaged through shops and homes in the southeastern state of Bolivar. In the beautiful country that used to boast the highest standard of living in Latin America, patients now die in hospitals for lack of basic health-care staples: soap, gloves, oxygen, drugs. In some medical wards, there isn't even water to wash the blood from operating tables. 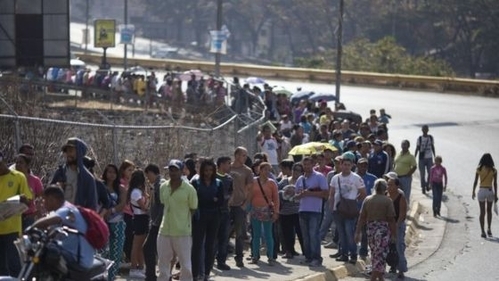 Citizens of Venezuela, once the most affluent country in Latin America, now routinely wait in extremely long lines to buy food. Government price controls, rationing, and seizure of private property have destroyed the nation's economy. Socialism invariably kills and impoverishes. Gushing oil revenues amid a global energy boom could temporarily disguise the corrosion caused by a government takeover of market functions. But only temporarily. The Chavez/Maduro "Bolivarian revolution" has been economic poison, just like every other Marxist "revolution" from Lenin's Russia to Kim Il Sung's North Korea to the Castros' Cuba. By shredding property rights, dictating prices, and trying to control supply and demand, socialist regimes eventually make everything worse and virtually everyone poorer. Conversely, when governments protect free markets and allow buyers and sellers to interact freely, prosperity expands. For three years in a row, Venezuela has ranked No. 1 on Johns Hopkins University economist Steve Hanke's "misery index," which ranks each of the world's countries according to a formula that adds its unemployment, interest, and inflation rates, then subtracts its annual change in GDP per capita. With Venezuelan currency virtually worthless — hyperinflation this year is estimated at higher than 700 percent — residents have to resort to humiliating and pathetic workarounds. Reuters reported this month that Venezuelan women have been flocking across the border into Colombia and selling their hair in their desperation to earn some money with which to buy food, medicine, or diapers. The government in Caracas, meanwhile, clings tightly to its socialist dogma, blaming the country's woes on Colombia's "mafia" or greedy businessmen. Ten days ago, government agents raided a toy distributor, confiscating nearly 4 million toys on the grounds that the company was planning to sell them at inflated prices. The regime says it will make the toys available at below-market prices to the poor — thereby ensuring that in Venezuela next Christmas, toys won't be available at any price. If nothing else, Venezuelan socialism has accomplished this much: It has transformed the Grinch from fiction into reality.